The demand within the global market for human microbiome has been rising alongside advancements in the field of advancements in the field of microscopic research on human health, finds Transparency Market Research. The competitors in the global human microbiome market are focusing on creating a stellar framework for continual growth. It is expected that the market vendors in the global human microbiome market would aim at continually revamping and re-analyzing their business strategies in order to earn the benefits of market innovation. Furthermore, the market for human microbiome is also expected to witness the emergence of new market vendors in the years to come. The leading market vendors in the global human microbiome market have made ardent efforts to ensure that their dominance remains unaffected. These vendors have directed huge of money towards outbound marketing, research and development, and clinical trials. The small and medium-sized vendors are under a negative spot due to the rising competition from the established. The small vendors in the global human microbiome market may form collective alliances to sustain in the market. Some of the key vendors in the global market for human microbiome are Seres Therapeutics, Rebiotix, Inc., uBiome, Inc., Enterome, and Biosciences. Transparency Market Research (TMR) finds that the global human microbiome market would expand at a healthy CAGR of 9.80% over the period between 2018 and 2026. Furthermore, the cumulative value of the global human microbiome is expected to touch US$ 1888.9 Mn by 2026. On the basis of geography, the market for human microbiome in North America is expected to expand at a stellar pace in the years to come. This essentially owes to the presence of key research entities in the US and Canada. The past decade has witnessed key advancements in the field of next-generation sequencing and metagenomics. This has in turn played a major role in the growth of the global human microbiome market in recent times. Moreover, the collection of genomic samples for humans has become easier, thus, giving an impetus to the growth of the global human microbiome market. The rising incidence of genomic disorders has also aided the growth of the global human microbiome market. Gastrointestinal diseases have also been on a rise in recent times, and this factor is projected to play a crucial role in the growth of the global human microbiome market. The rising incidence of diseases such as cancer, Crohn’s syndrome, and bowel syndrome has given an impetus to the growth of the global human microbiome market. Furthermore, the presence of several research centers that are paying immense attention on the study of human microbiomes has also aided market growth. The betterment of the healthcare sector in the recent past is being hailed as a harbinger for growth within the global human microbiome market. Curing metabolic disorders and diseases also involves the study of the human microbiome. This is another crucial dynamic that has played to the advantage of the global human microbiome market. 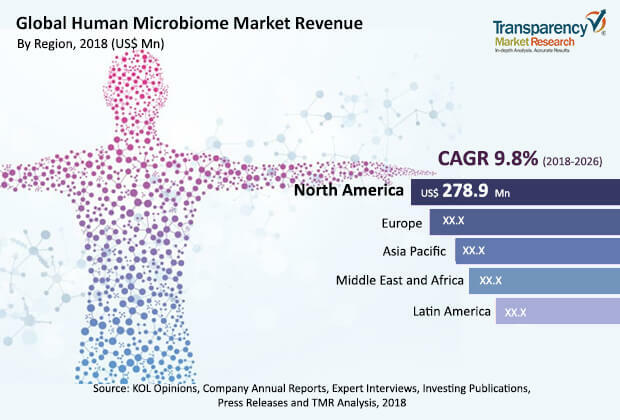 The review is based TMR’s report titled, “Global Human Microbiome Market for Diagnostics to worth US$ 1,888.9 Mn by 2026; Patient Preference for Non-Invasive Tests and Novel Therapies to Drive Market Growth: Transparency Market Research”.